You are at:Start Reading»Pregnancy»Diet & Fitness»Is Lox Safe To Eat During Pregnancy? Eating during pregnancy should not be as confusing as it is. After all, during pregnancy you are allowed to indulge in roughly 300 extra calories per day, are you not? More often, what puts on unnecessary anxiety is the conflicting advice on what to eat and what not to eat. If you are a seafood lover and are pregnant, chances are that you are in a big dilemma about what to eat and what not to eat! Furthermore, if you are a fan of refrigerated smoked fish, you might have heard more contradictory advice. Well, here is some information you might want to read about seafood – especially Lox if you are pregnant. Lox is nothing but seafood, which is originated from Salmon fish. It is basically the belly of the Salmon Fish. It is also sometimes referred to as Belly Lox. This seafood is treated with salt for a long time, probably even weeks in order to make it salty for the brining process. Lox is never cooked or smoked. Therefore, it has a very unique texture and taste which attracts foodies. Is It Safe To Eat Lox During Pregnancy? No, the minute you come to know of your pregnancy, it is highly suggested that you stop eating refrigerated lox. This is because sometimes, Lox could be contaminated with bacteria such as Listeria, which can be harmful to consume during pregnancy as it may affect the fetus. Not only lox, any other raw and uncooked seafood is at the risk of being contaminated by infection-causing microbes, which is not safe to consume during pregnancy. If you want to keep yourself as well as the fetus safe, then steer clear of any such infections that can be caused by consuming refrigerated, raw and uncooked foods. Is There Any Means To Eat Lox Safely During Pregnancy? Lox is relatively safe if used as an ingredient, rather than raw, in a meal that has been cooked piping hot, like a casserole. Therefore, if you wish to have lox, then ensure it is cooked thoroughly inside and out. This will help to discard the bacteria’s in it so that you can avoid food poisoning at the time of pregnancy. However, we strongly recommend consulting with your doctor before consuming Lox and other such seafood during pregnancy. What Are The Health Benefits Of Eating Lox? Lox or salmon as a whole has a high concentration of omega-3 fatty acids. Omega 3 plays a vital part in decreasing the risk of any cardiovascular issues. It helps to reduce the risk of high blood pressure. Lox is rich in protein. Proteins are essential nutrients that contain amino acids and its adequate intake is very crucial during pregnancy. The protein in salmon is a lean protein, which means it has reduced the amount of saturated fat, which is more beneficial during pregnancy. Lox is rich in potassium and magnesium. Muscle cramps are very common among expecting mothers. One of the main reasons is inadequate intake of magnesium and potassium. Therefore eating lox will help to alleviate muscle cramps during pregnancy. Lox is a good source of selenium. It is very beneficial in preventing joint inflammation. Joint pain due to inflammation is a common issue during pregnancy. Lox contains bioactive proteins that aids in strengthening joints and bones. It is very important for pregnancy period. As mentioned above, lox is a superior source of selenium. It provides 32.4 micrograms of selenium per serving, which accounts for about 50% of the recommended daily intake. Selenium plays a vital role in the proper functioning of your thyroid. Remember, hypo or hyperthyroid during pregnancy can bring about lots of issues for mother and child. Cholesterol level increases by 25 to 50 % during pregnancy. It is essential to provide nutrients for the growing fetus. However, usually the level of good cholesterol (HDL). Fall in the HDL level can bring about several risks. Vitamin B3 (Niacin) and Vitamin B12 are richly available in Lox. These vitamins in this seafood help to increase the HDL, the good cholesterol level of the expecting mother. How To Prepare Lox At Home? 1. First, mix the peppercorns, sugar and sea salt. 2. Clean and place the salmon on the parchment paper. 3. Spread the powdered mixture evenly on both the sides of the salmon. 4. Now, lightly sprinkle the whey powder uniformly on both the sides of the salmon. 5. Follow it by placing the dill over the salmon. 6. You can now use the parchment paper to wrap the fish and cover it. 7. Place your mise-en-place in the refrigerator and flip the salmon over after every 12 to 14 hours to equally give both sides the exposure. 8. This mise-en-place needs to be kept in the refrigerator for almost 4 – 6 days. 9. You can then remove the dish from the refrigerator and cut it into small pieces to use. 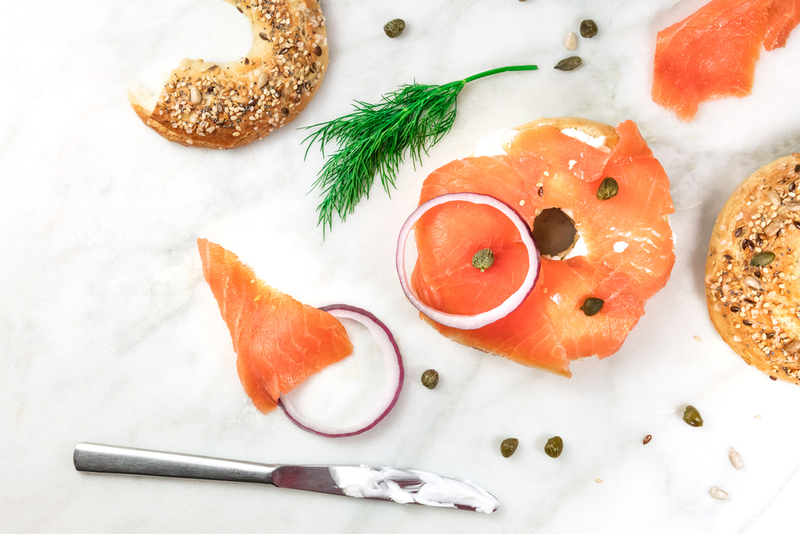 The most favored way to relish the Lox is to have it with a multigrain bagel for a healthy breakfast. If you have consumed Lox during pregnancy and noticed or experienced any side effects, please share it in the comments below and do the to-be-moms a favor! Next Article Baby Born With Teeth – Is It Normal ?